It has long been recognized that many sesquiterpene lactones possess very prominent anti-infective as well as antitumour potential. The structure-activity relationships underlying these as well as many other aspects of their biological activity have been reviewed extensively. Since 2006, a variety of new data have emerged that warrant an update. The activity of sesquiterpene lactones against “protozoan” parasites has been the topic of studies from various laboratories, and the current chapter will attempt a synopsis of the existing biological data related to inhibitory effects on parasites of the genera Trypanosoma, Leishmania and Plasmodium as causative agents of major tropical diseases. Besides some recent new mechanistic evidence to explain the strong anti-trypanosomal activity of certain sesquiterpene lactones, a main focus will be on quantitative structure-activity relationship studies which have recently led to the discovery of certain furanoheliangolide-type compounds as extremely potent agents against Trypanosoma brucei, the pathogen responsible for human African trypanosomiasis or “sleeping sickness”. Investigations on the long-known antitumoural potential of sesquiterpene lactones have recently received new impetus by the finding that certain compounds of this class possess a hitherto unknown mechanism of action that may make them interesting leads, or even therapeutic agents, against certain types of leukaemia and some other tumours known to be characterized by an excessive activity of the transcription factor c-Myb. This factor plays important roles in cell proliferation and differentiation and has been identified as an interesting drug target. Sesquiterpene lactones were discovered as the first type of low-molecular-weight inhibitors of c-Myb and C/EBP transcriptional activity. 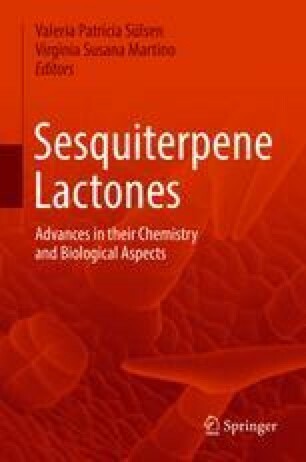 Besides extensive QSAR studies on this new activity of sesquiterpene lactones, the chapter will also focus on very recent mechanistic studies into the peculiar mode of action of the most active sesquiterpene lactones on the transcriptional activity of c-Myb and C/EBP. I feel deeply grateful to all the co-workers, mainly doctoral students, who have contributed over the years to STL research in my group. Not all my students have been working on the discovery of new STLs but even those who did not have – in different ways – contributed to this work. Very cordial thanks are due to Marcel Kaiser and Reto Brun of the Swiss Tropical and Public Health Institute, Basel, and to Karl-Heinz Klempnauer of the Institute of Biochemistry, University of Münster, for their continuous and very fruitful cooperation over many years. I also thank the many collaborators within the Research Network Natural Products against Neglected Diseases (http://www.ResNetNPND.org), who contributed bigger or smaller pieces to STL research in the past or present: Sami A. Khalid, Fernando B. Da Costa, Norberto P. Lopes, Luise Krauth-Siegel, William Setzer, Marcelo Comini, Antonia Do Amaral and, most recently, Valeria Sülsen. Thanks also to all others who cooperate with me, but not only on the study of STLs. Finally, I would like to acknowledge gratefully once more the support and inspiration by my former mentor and Doktorvater Günter Willuhn (formerly University of Düsseldorf). Thank you for awakening my interest in this fascinating class of natural products: sesquiterpene lactones.